Haiti gets into the hearts of people who come here in a way that is, I believe, unique. I know it did for me, and many of my friends and even after many years of leading groups here I am still inspired and in love with this place. 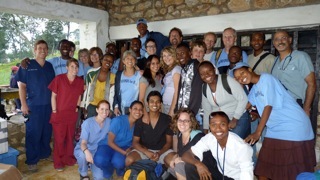 It is rewarding for me to see a love for Haiti take root and grow in the medical teams we bring to Haiti. It is particularly remarkable because of the challenging nature of our expeditions. Traveling on bad roads in cramped vehicles, setting up clinics in buildings that are not designed to hold 6 doctors, 3 dentists, a pharmacy and dental hygiene team, plus all the interpreters and staff required to manage 100’s of sick and impatient people. It happens in spite of all the challenges, or maybe because of all the hardship, the rewards are greater, I don’t know but I witness Haiti taking root and growing in their hearts of each person who participates in our medical trips. By the end of the week each person is making plans to return on another trip or to help in some way. And many are planning to bring their friends and family. 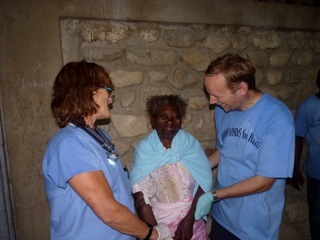 We do amazing things our medical providers, many of them having served in other developing countries become committed to our cause so we know that what we are doing is medically valid, as well as helping the desperately needed by the people we serve who do not have access to medical or dental care. It can be heart breaking for practitioners of modern medicine to have no recourse but to offer less than the very best that modern medicine can offer. But when it becomes clear that referring a patient to the hospital or a specialist is not an option, somehow, we are able to save lives anyway. Or on occasion when there is a hospital near by taking a dying infant there in our vehicles and paying for treatment can save a life. In Marigot we had two such cases, a tiny sick baby less than 6 weeks old had not drank or eaten in 3 days, she would still respond but just barely. She would certainly have died later that day if we had not been able to quickly send her off to Jacmel where there was a hospital. These cases always leave me thinking about other babies and mothers in Haiti who are not as lucky as to have a mobile clinic show up that day in their village. Another was an old woman carried in mostly unconscious, soiled with diarrhea and vomiting. 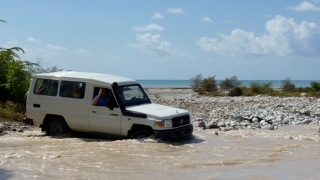 We came ready to treat cholera and at first suspected that was what we were seeing. Whatever her ultimate diagnoses would be, treatment, to start was the same. All the docs and nurses worked together discussing treatment and our NP from Canada Alicia, got an IV started with the one appropriate needle we had for the vein, less medical folks got the IV bag rigged up above her as she lay on the ground on the terrace, the only space available. Then our ER nurse from Berkeley, Lois, took on the job of getting some medication in to her mashing up the medication in a cup (we did not have medicated fluid that could go into the IV) and mixing it with something that would help her get it down. To start with she threw it all back up but Lois kept on mashing and spoon feeding, and coaxing her to eat with the help of Thamara her interpreter. 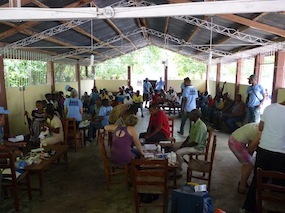 All of our Haitian staff becomes involved with any person that comes to us really ill. Bringing them to our attention, making a path through the crowd and everyone immediately begins to help. As it turned out the woman was brought in by her neighbors. She had no family, she was just being taken care of by the community. At one point when we asked if it was possible for someone to go to the hospital with her, there was no one to go so we continued to do what we could at the clinic. Eventually after two bags of IV fluid and medications she began to get a “little Fiesty” as Lois said. An hour later she was recovering well enough to sit up and the stand and even smile because of her response to the treatment our staff determined that it was not cholera. Maybe that is how Haiti grows in our hearts when we see how we can make a difference, some with our medical or dental skills, all of us by just being here in someone’s hour of need. amazing stories Annie, thanks so much for replying. the world needs to hear about this stuff.